Since we integrated our five spring chicks into the main flock a couple months ago, they have found their place in the pecking order - at the bottom! For the most part, the new girls just stay away from the big girls, which has made their merger surprisingly smooth. Within the group of new girls, I have noticed that Summer and Goldie seem to have formed a special and very sweet friendship. When they are in the run, I always see them together. Even when they are out free ranging and wander off from the flock in search of treats, they stick together; never straying too far from one another and alerting each other when they find an extra special bug or other tasty treat. Each of my chickens has a different personality, and some tend to be loners whereas others prefer the company of certain girls. It really is sweet to watch Summer and Goldie's blossoming friendship. I'm sure in their clucks and chirps there is a lot of gossip going on about the big girls and the handsome head rooster! Goldie close behind - her legs just barely visible at the top of the photo. Have you noticed any special relationships within your flock? Aside from Goldie and Summer's friendship, how has the interaction been eith the other old vs. new members? Any tension? How cute, that Summer and Goldie have bonded so well. They will be friends. They are pretty. Great post, Tammy! Have a happy weekend! That's neat that they are such good buddies. The only thing I have noticed is the young girls sticking together and trying to avoid the older girls. Our girls have definitely developed some cliques, mostly amoungst their own breeds which is rather funny since they were all raised together. I guess somehow they just know the difference! oops I meant "two" and I also meant to say your pullets are looking great ! It's interesting how they will gravitate toward one another...or not. We had a flock of 15. One cockerel had his harem of five that spent the days outside foraging and taking dust baths together while the others didn't seem clique-ish at all. Fun we both posted about our pullets! Well, we've noticed the opposite of paling around. The ladies have turned on mama hen (the original left after the animals got the rest). Poor thing was pecked so much. She's separated from the rest, recuperating. Sad day for mama hen. So sweet! The two Cochin Bantams we brought into the flock last, Sandy and Butterscotch, seem to be inseparable. Especially at night time, there isn't an inch between them on the perch! All three of ours get along great. However, Grace and Joni are a bit tighter and Carly is close by, but just not "right there" if you know what I mean. Our four stick close together at all times when they're let out to roam, but we do have some chasing going on.. and I can't figure out who's starting it - the little banties or the buffs.. they take turns charging eachother & zoom in a circle, and then go back to pecking happily together. It's very entertaining! Oh, how cute. I love reading about your chickens. It makes me want some of my own so badly. Also, I just adore your writing style! Have you read the book, "Once Upon a Flock"?? Stories of her backyard chickens and the personalities and interactions of, The Girls"!! Summer and Goldie are cutie pies!! I wish I had a flock..........:( One day!!! Could you come to my house and help get my flock started......:) I stil am amazed at the personalities of the hens...so funny and entertaining.. Thanks for your "flock stories". Blessings! hey tammy, i just love your style of writing. i really enjoyed reading about your chickens as well as the photos of them. ...a precious friendship for sure! My DIL got 3 Black Cochins, who are very chummy, and tried to introduce her older Sicilian Buttercup, but they never seemed to warm up to her and were pecking her so the SB had to come back to live with her old chickens that I have been keeping. The old chickens don't lay even though they are only a couple of years old. But one laid 3 eggs recently then ate 2 of them, and some hen ate the SB's last egg. 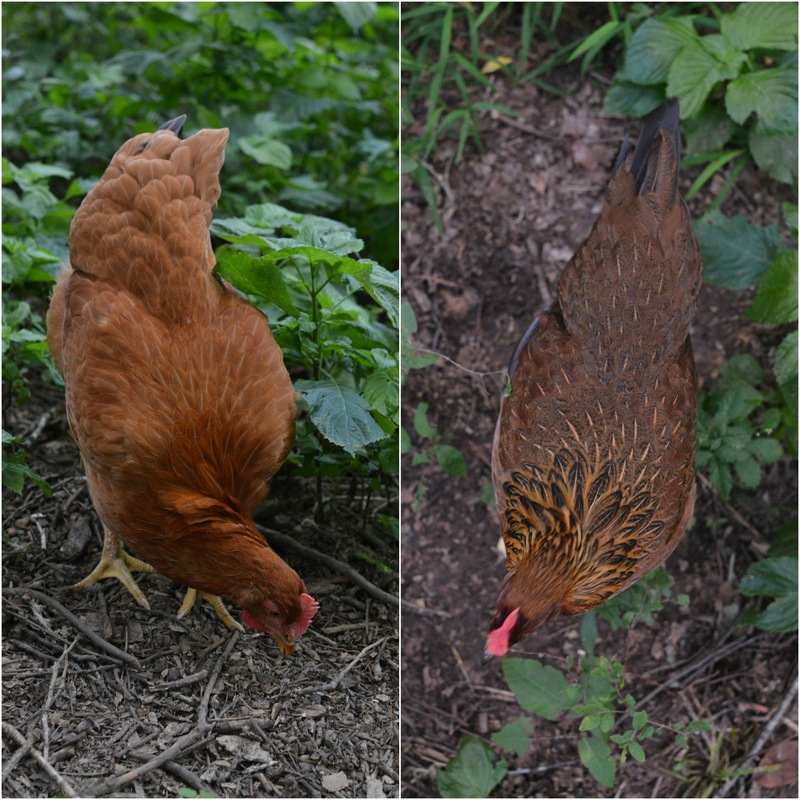 We've been feeling like having them for dinner, is there any hope for an egg-eating chicken? It is so interesting to learn that chickens have such personalities and special friendships, much like us humans! Oh - they really are so sweet! They are so pretty! Love the new girls! I have 3 girls that are inseparable, the rest just kinda mix and mingle.